Superintendent Tate Hill is the Pastor of Bethel Temple Church of God in Christ in Fresno, California. He gave his life to Christ in 1970, while attending a Christmas revival led by Elder Peterson of White Rose COGIC (Stockton, CA) at St. Paul COGIC (Bakersfield, CA), where he received his early training under the late Superintendent Duffey. As a young Christian, he was faithful to the Lord and his church while in college and attending White Rose COGIC. His willingness to serve and formal education in music opened doors for him as choir director at Glad Tiding COGIC under 2nd Assistant Presiding Bishop JW Macklin and later as a church trustee. 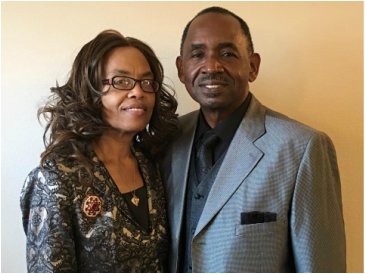 Upon establishing roots in Fresno and a home at Bethel Temple COGIC, he served in various capacities under the leadership of the late First Administrative Assistant Stafford Brown from Head Deacon and Sunday School superintendent to assistant pastor. Near the completion of the new construction project, Elder Hill was appointed pastor of Bethel Temple Church of God in Christ by jurisdictional prelate, Bishop Samuel L. Doyle. Under his leadership the church has grown its ministries to address homelessness, domestic violence and community revitalization. Pastor Hill was elevated to the position of superintendent of the Central Valley District in 2006 in which he had served in for more than 25 years. Superintendent Hill has served under three District Superintendents as the District Minister of Music, the District Sunday School Superintendent, and Assistant District superintendent. His administrative and teaching gifts have been called upon by the bishop as the California Valley Jurisdiction Assistant Sunday School Superintendent, as a California Valley Jurisdiction CH Mason Bible Institute instructor, member of the Jurisdictional Executive Committee and as Jurisdictional Treasurer. In 2013, Superintendent Hill was one of four inaugural recipients of the Excellence of Service medal by Bishop Samuel L. Doyle at the 43rd Annual Jurisdictional Holy Convocation. Superintendent Hill has a B.A. in Music Education from the University of Pacific’s Conservatory of Music. He has introduced kindergarteners to the high school seniors to music ranging from classical to gospel for over nearly 30 years in southwest Fresno. His choirs and bands have performed all over California including several music festivals and competitions. His dedication to students was acknowledged as a West Fresno School District Teacher of the Year. In 2006, CA State Assemblymember Juan Arambula recognized his contributions to education as one the inaugural recipients of the African-American Heritage Award. In addition to being a music teacher by academic training and profession, Elder Hill is a California-licensed general contractor. Following in the footsteps of his mentor, he has used that license to build, remodel and repair more than fourteen churches between Madera and Bakersfield.